Warlords of Draenor is here and there have been a few changes, though not like the last two expansions. Some abilities have been trimmed or moves to one or another spec (for example, you no longer have Shatter, but Presence of Mind is exclusively yours.) Alter Time & Mirror image are now talents. And, of course, ten more levels and a new talent row. 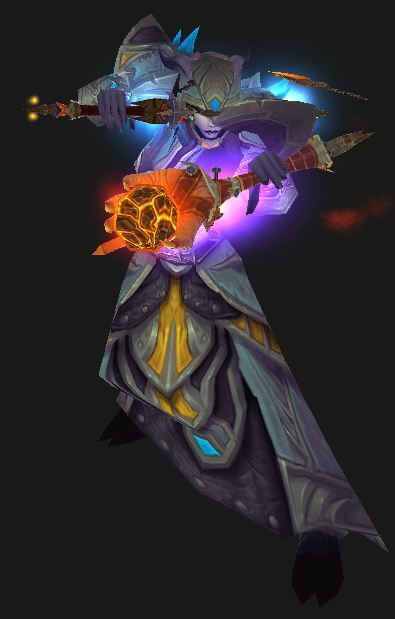 You can see our Mage Changes in Warlords post for more details. This page covers Arcane for PvE content (raids and such,) so if you’re looking for PvP or leveling then see the links just below. This Arcane Mage guide is primarily intended for Raid DPS use (and other PvE content) at level 100. However, the principals will still apply during the leveling process. If you’re looking for advice on leveling your Mage, check out our Mage Leveling Guide. Talents can be easily changed to suit particular fights or situations. Keep a stack of Tome of the Clear Mind handy and swap them as necessary. Ditto with glyphs. Note that many of the talents are quite good for general use, so don’t hesitate to experiment. Evanesce – Avoid all attacks for three seconds and replaces your Ice Block. If you need a “save me, now” ability more often than Ice Block then this is your pick. It does not wipe existing effects, just avoids new ones. Blazing Speed is a nice little speed boost, which can be handy to getting to, or out of, stuff. You still have blink, of course, and can use B. Speed when Blink’s on cooldown. Ice Floes Gives you a chance to cast (Evocation, for example) while moving and has three charges. Depending on the fight that could be very useful, especially since you have more “cast time” spells than the other mages. None of these add to DPS, other than allowing you to live long enough to continue dealing your damage. Alter Time, when timed right this can avoid large quantities of damage. Note that it doesn’t help if that damage kills you. It can also reposition you if you have to move away for a few seconds. Alter Time will then pop you back. It does not restore mana, procs, buffs, or anything other than your health. Flameglow constantly mitigates some damage. It’s a great choice for fights where you anticipate taking constant, relatively minor, damage. It won’t make you a tank, but it will make the healer’s (and your) lives a bit easier. In those situations of fairly constant damage it can stop more damage than Ice Barrier. Ice Barrier doesn’t absorb a ton, but it can save your but in the right situation and you don’t have to time it as well as Alter Time. Which one of these you pick depends on the situation. None add to your DPS and all are only useful against trash. Ring of Frost is an AoE CC for any encounter in which you might need it, such as a patrol. Keep in mind that it takes a couple of seconds to do it’s thing, even with Presence of Mind. Ice Ward might be difficult to find a good use for, but has decent creative potential. For example, if you’re helping someone to kite a mob or mobs. It still casts Frost Nova, even if you take Supernova from tier 5. Frostjaw is a single target root and silence, which is always useful against caster adds. For groups, Ring of Frost will be superior. Greater Invisibility is a decent survivability option and, depending on the encounter, can compete with Cauterize, Useful if you tend to, somehow, gain aggro or get dotted up. It’s a DPS loss, since you con’t be casting while it’s in effect. Cauterize is beautiful by virtue of its simplicity. Instead of dying, you don’t, which is perfect for those You Will Die Now moments. You will burn, but it gives your healer a chance to get to you and your Ice Block cancels the burn. It doesn’t effect your DPS if your healers can get to you, it does if you have to Ice Block it off. Cold Snap resets your Presence of Mind, along with Ice Block and Frost Nova, and provides a small heal. If you don’t need the defensive abilities of the other two then this is a solid choice. Nether Tempest takes a “snapshot” of your current charges and bases its damage from there, both to the primary target and to all other targets within 10 yards. If you reapply it within the last 3.6 seconds you add that remaining time to your new application. Can only be used on one target at a time. When fighting groups or waves take a look at Supernova instead. Unstable Magic is the easiest to use of these three, doing good single target damage and decent A of E damage. You don’t have to change anything about your rotation, just blast away. Supernova replaces your Frost Nova. It deals 400% damage to the main target and a pulse that does 200% to all targets within 8 yards, in addition to knocking them upwards. Two charges on a 25 second cooldown. Nice choice for waves of adds and very nice for single target. Mirror is nice for short fights or where a burst phase is required. Otherwise, if you can stay in one place take Rune. If you have to move around too much for that, take Incanter’s flow. Mirror Images creates three images which blast away for decent damage. They all of your stats except Mastery, which is the one you really want them to have. Nice for a 25 second burst every couple minutes. Rune of Power is the simplest to use of this tier, seeing as all you have to do is stand in it to get that 15% damage increase and blast away. Best used on fights with little or no movement or where you can place yourself such that you don’t need to move. Place the rune(s) and blast away. If you have to move away for a brief time than your Alter Time can pop you back to your Rune. Incanter’s Flow can work well with Supernova and your Mastery if you can cast it at peak flow and peak mana. Otherwise it’s an average of about a 12% boost which doesn’t require you to stay in one place. Use the Crystal for single target fights when the mob stays still. Use Overpowered for when he’s running around a lot. For multiple opponents and If you took Nether Temptest, from the tier 5 talents, then Arcane Orb is the most efficient pick. Prismatic Crystal: Puts a crystal at the targeted location. Only you can attack it and it takes 130% damage from your attacks. Any time it takes damage it instantly releases that damage, splitting it evenly among all enemies within 8 yards. The downside is the possibility of your tank, or some other mechanic, moving the target(s) away from your crystal. Arcane Orb: Your Arcane Orb travels up to 40 yards doing damage to everything it passes through and it generates an Arcane Charge every time it does damage. Nice way to build charges without casting Arcane Blast. As with talents you can change these as necessary. Glyph of Arcane Power – doubles the damage boost, but increases the cooldown to 3 min. Nice for “burn it down” phases. If you have trinket or gear that boosts your Arcane Blast then skip this glyph. Cone of Cold – Doubles the damage. Glyph of Ice Block improves your Ice Block: when it ends or you cancel it then a free Frost Nova is cast and you’re immune to spells (not physical damage) for three seconds. Note that a Frost Nova is cast even if you took the Ice Nova talent, which otherwise replaces Frost Nova. Glyph of Counterspell – useful if you use the spell often. Most of the minors are pretty much just cosmetic. Glyph of Momentum – Nice for strafing. Blink in the direction you’re moving rather than looking. Warlords note: Your Hit, Expertise, and Reforging are all gone. You have two new stats, Versatility and Mastery, both of which have some (not a lot of) value. Gear: Int plus Mastery & Haste. Int is your “go to” stat and is more important than any secondary stat. It is your Spellpower, so improves any damage that you do. Mastery rewards you for keeping your mana high. So stack this stat way up and keep your mana as high as possible though evocation, potions, good management, etc. Haste speeds up everything you do, including burning mana. Spells cast faster and DoTs tick faster. Lots of Haste is a good thing, but you will have to watch your mana a bit more closely. Certain items will summon minions to fight for you and this improves the value of your Haste as those minions are affected by it. Mastery will remain better until very high gear levels. Multistrike gives you a chance for one or two additional strikes at 30% effect. While it’s a straight up DPS add it’s not as valuable as Mastery and Haste. See here for how Multistrike works. Crit – it’s not that Crit is bad or useless, it’s that the other stars are better. Versatility adds directly to your damage and (at half value) to your damage reduction. Nice stat, but not enough to compete with the rest. Keep your mana as high as you can at all times to take advantage of your Mastery. Potions can help keep it up. Buffs: Mage Armor and Arcane Brilliance should be active at all times. Arcane Blast is your primary damaging ability and used to build stacks of Arcane Charge. Arcane Blast – Damage increased by 50% per charge and mana cost by 100% per charge and it generates a charge. Arcane Missiles – Damage increased by 50% per charge and it generates a charge. Arcane Explosion refreshes your charges and has a chance to generate one charge if at least one target is hit. Arcane Barrage comsumes all charges – Damage increased by 50% per charge and strikes an additional target, per charge, for 50% damage. Evocation consumes all charges and its mana regen is increased by 25% per charge used. Arcane Missiles should be cast whenever it procs as essentially a mana-free Arcane Blast which is important given that our strategy revolves around maintaining as close to a full mana pool as possible at all times. Arcane Barrage should be used to dump Arcane Charges when you’ve built a stack of 4 charges. Arcane Power should be activated when available at which time you then spam Arcane Blast and Arcane Missiles whenever it procs until Arcane Power fades. If you took Presence of Mind you should use it as often as possible to instantly cast Arcane Blast. Your level 90 talent is to be used as available. Nether Tempest is ideal for facing small groups of 2-4 enemies in which case you should aim to refresh the effect with around 3 seconds remaining. Cast Arcane Barrage when your Arcane Charge stack is equal to one less than the total number of enemies as each charge causes Arcane Barrage to hit one additional target for 50% of normal damage. Use Ice Floes (if you took it) whenever movement is demanded to continue casting Arcane Blast or Arcane Missiles. Use Blazing Speed (if you have that instead) to position yourself as necessary to continue blasting away. Nether Tempest should be refreshed on the target at around 3 seconds remaining. That remaining time is added to the new spell’s duration. Presence of Mind gives you an instant cast of Arcane Blast every 90 seconds. It’s a minor DPS gain. 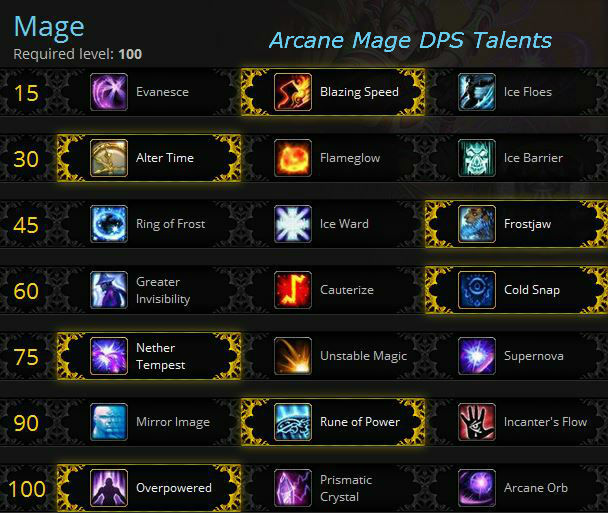 Arcane Power is your major DPS cooldown. Use on cooldown, unless you need to save it for a particular phase of the fight. Note that the Improved Arcane Power perk reduces the cost of your spells, instead of increasing them. The glyph of Arcane Power doubles the bonus and the cooldown time. Time Warp is a very powerful raid cooldown. It should be used when your raid leader tells you to use it, as you can only receive its buff once every 10 minutes. This cooldown is shared with Heroism/Bloodlust. The following section was taken from Berlinia’s Arcane Mage Guide on MMO-Champion. The Arcane Mage constantly rotates around two phases, the Conserve Phase and the Burn Phase. The Conserve Phase is what you will be doing most of the time, and is a playstyle that you employ when you want to remain on high mana levels. The Burn Phase on the other hand is the practice of using the 400% increase to Arcane Blast’s mana cost at 4 Arcane Charges to your advantage, in order to burn through your mana as fast as possible. This phase might seem contradictory to what I just wrote about benefiting from Mastery, but is done because Arcane Blast does a very high amount of damage during this phase. In order to start your Burn Phase you need to keep an eye to your Evocation cooldown, because when you finish burning your mana you want to get it right back up and continue with the Conserve Phase. The Arcane playstyle is a constant rotation between Burn and Conserve cycles. There is no set rotation for Arcane Mages, just a priority list. This is the priority list for the Mana Conservation Phase which is the phase you will mostly be executing. Cast Arcane Missiles when you have 3 stacks of Arcane Missiles!. Cast Arcane Blast when you have more than 93% Mana at the start of your cast, and you have 4 stacks of Arcane Charge. Use Arcane Barrage to reset your Arcane Charges. Just like with the Conserve Phase, the Burn phase does not follow a strict rotation but rather a priority list. This phase is heavily tied to the cooldown of your Evocation and can only be started when you are at 4 Arcane Charges. Cast Arcane Blast if you have more than 50% mana. Cast Evocation if you have less than 50% mana and 4 stacks of Arcane Charge. This is the priority list tied to the Burn Phase. What this list essentially tells you is that you should cast Arcane Missiles as they proc, and then burn your mana until you have less than 50% mana. Due to the high mana costs of Arcane Blast at 4 stacks of Arcane Charges, you will need to know the mana costs of your spells of your spells so you know when to execute the third step of the priority list. The 35 point gems are dirt cheap, the 50s expensive, and the 75s very expensive. If you have four gems slots (lucky you) you will only lose about 1% Mastery (going from 4x75s to 4x50s) and save maybe 20k gold. If you find yourself short of the cash needed to buy expensive gems then you should see this post. In Warlords the older gems that used to Hit now add Crit, those that added Expertise now add Haste. Prismatic gems fit any socket and the the Warlords gems require item level 600+. Your Mage bonus adds to any Int gem bonuses, making them worth 5% more Int, that bonus does not add to other stats. Meta: Get the Courageous Primal Diamond if you can, otherwise Burning Primal Diamond will do. In short, use: Enchant Weapon – Mark of Bleeding Hollow – Sometimes increases Mastery by 500 for 12 seconds. In Warlords the stats squish is in, but since everything is squished your enchants will still have nearly the same relative value. Also note that rings and neck items can now be enchanted. Note that the Mists enchants cannot be added to items higher than ilevel 600. Note: There is a “Glory of” version of each of these enchants which appear to be just the same as the above, so they are not included here. No Draenor “off hand” weapon enchants are available. Enchant Weapon – Jade Spirit: Sometimes increases Int by 83, might increase Spirit by 38 if mana is low. Note that any of the high level enchants can be added to the lowest level gear. So go ahead and put Mastery enchants (or whatever) on your low level heirlooms. Pre 90: Heirlooms are generally as good or better than any other gear you’ll find until 91. Otherwise just get the best gear you can find or buy. Enchant for Mastery or Haste. Shockingly enough, the best way to get a decent gear level (670) to start your raiding is to get the PvP Honor Gear set. Yes, PvP. Note that those crafted items (above) will be better, when maxed out, than even the best PvP gear for PvE. Join an Ashran conflict (Yeah, I know) and you can get a full 670 set in a few hours. If you have a good team then it’s much less painful than otherwise. Stick like glue to the biggest group you can find and blast away. If you do the PvP route then get the trinket pair first (one needs to be an escape trinket) for the 15% damage reduction from other players. Next is the weapon. Then fill out the rest. This Video will show you have to get your gear leveled to 700 or so as quickly as possible. It’s pretty complete and will get you more than ready to being your 6.2 raiding. Oralius’ Whispering Crystal: +57 to all stats. This is better than the focus rune, below, and is not used up. Focus Augment Rune: +50 Int for one hour. Occasionally drops from WoD bosses (in Raid Finder mode) and is also rarely found as mission rewards from your Garrison. Stacks with flasks and other buffs. Oralius’ Whispering Crystal: +57 to all stats. In Warlords all of the profession perks are dead. No more extra Blacksmithing sockets, cloak enchant, etc. You might be best served by using your professions to build a larger gold stash. Still, they’re not without some value, other than earning gold. See the notes below. The “best” profs? Probably tailoring for the gear and Engineering for the gadgets. For gold? Gathering is Ok. I’ve made a ton with Inscription and a fair amount with Blacksmithing. Others swear by Jewelcrafting. Tailoring and Enchanting can work very well, too. Garrisons are pretty useful. Get a level 2+ profession building and a follower working in it and you’ll get better production and some other goodies. Note that you don’t actually have to have the profession to make a number of the Draenor items, such as most of your enchants. Crafted gear works like this: You can make ilevel 640 armor (Tailoring) and 630 weapons (Inscription) and then the items to reroll the stats of the armor & weapons. (Reroll until you get that Mastery & Haste that you want.) You can also make the items to boost your armor and weapons by 75 item levels (in patch 6.2.) This is expensive, but it’s there if you want it. Tailoring Make your own gear, including some nice entry level raid gear. Leatherworking Nothing much here for Mages. Your follower will let you make tents that add 10% to all of your stats for an hour. While these cannot be used in raid they are account bound and work on any level character. So make a bunch and send them to all of your alts. Jewelcrafting Make nice gems, ring and neck items, gemmed mounts, etc. Enchanting Enchant rings and neck items and almost everything else. Your follower will let you make Illusionary Enchants, which will change the look of your other enchants. Inscription Make glyphs, fortune cards, caster items for main and off hands, shoulder enchants, misc other things. Make caster weapons. Alchemy Better living through chemistry and transmutation, but no explosives. Your follower will give you four useful potions every day. Engineering has lots of interesting toys, including gliders, nitro boosts, and mounts. Don’t forget the rockets, shields, gliders, and stealth device. None of which can be used in raids, but can be used most everywhere else. Skinning For the gold and to supply Leatherworking. Herbalism For the gold and to supply Alchemy and Inscription. Mining For the gold and to supply Blacksmithing. The Tauren are the only race that cannot become mages. Even the Pandarens can be Mages. In Warlords any racial ability that raised Hit or Expertise is now dead. A few races that had those abilities got replacement abilities. For DPS purposes they are now all very close. The Best? Draenei get an Int boost and Pandarens get an increased bonus from food buffs. Gnomes and Goblins get a 1% Haste boost. Orcs and Trolls get a burst cooldown. They can put enemies to sleep (stun) with a touch of the paw, but you don’t want to be in melee range. A minor heal is always handy for a class that has no heals. Also usable on others. Especially nice while leveling, though a bit of “topping off” in your raids will be handy. Draenei get a boost to their Int (and Str and Ag.) Since Int is your best stat this is rather nice. Can periodically move quickly, which is a generally nice ability in all cases. Crit chance increased, but Crit isn’t a great stat for you. Gnomes have a useful Escape Artist skill. It’s more useful in PvP, but will still be handy at times. Unlike the Human escape, this one does not break roots. Gnomes have an increased mana pool, which is certainly of interest to you in particular. Engineering skill doesn’t help casting, but that skill can make some nice gadgets which will help. Just be aware of backfires. Good for PvP with their Escape ability. Also allows the use of two DPS trinkets. This ability will have occasional use in PvE and leveling, as well. Unlike the Gnbome escape, this one does break roots. Diplomacy is nice if you are going to be gaining faction at any point and since so much past level 60 is a faction grind… Mists of Pandaria introduced even more factions. The Human Spirit now adds to your Versatilty stat, which adds a bit to your offence. Their Shadowmeld ability has its uses in instances and raids it will drop the aggro you picked up until you unmeld. Hopefully the tank has picked the mob(s) up by then. Being a bit harder to hit is occasionally use while leveling or in PvP, but you will find little use for it in PvE. Berserking increases Haste for a few seconds. Very nice ability for any mage, drop it into a macro. Voodoo shuffle is a help in PvP, but very situational otherwise. Blood Fury adds to spell power as well as attack power. Put it in a macro. This one ability might make Orcs the best DPS choice for Arcane mages. Cannibalize is useful every now and then, especially since you won’t have to carry food. Touch of the Grave is a passive ability that drains life and heals. It will add a bit to your damage numbers as well as improve your longevity. Arcane Torrent is of little use, since it doesn’t return much mana and the opponent has to be close to you for the silence to work and casters will rarely be that close (though DKs might be…) On the other hand, if you’re bouncing in to drop a Frost Nova on some caster trash then an AT might not be a bad thing to throw in along with it. A nice discussion on “How To Arcane.” Does not covers talents or gear very much, it’s mostly rotations. Leveling a Mage or some other class? It’s pretty easy these days, especially since Mages excel at destroying things. Still, there are a lot of quests and a incredible number of things to kill. Wouldn’t it be nice to have a bit of help in the “where to go and what to do” department? Zygor’s guide gives you that help, whether Horde or Alliance, at all times. It’s like having an expert showing you exactly where to go and what to do. Zygor’s has even gemmed for Int and, as a result, it doesn’t matter if you stop your questing to gain a few levels in PvP or the dungeons, you’re brand new to the game or you’re decked head to toe in heirlooms. 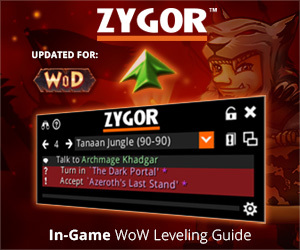 Come back to the quests and Zygor will figure out where you should be, based on your new level, and update the guide accordingly. It’ll even let you zap your obsolete quests. Did you boost to level 90? No sweat. Zygor still has your back and will who your where to go and what to do. Click here to grab your own copy and blast to the level cap. Or read our review, here.